Were the Clyde ferries free ? Was talking with a pal the other week, he was saying the small passenger ferries on the Clyde were free to use. I was surprised, as I always assumed they charged a fair. 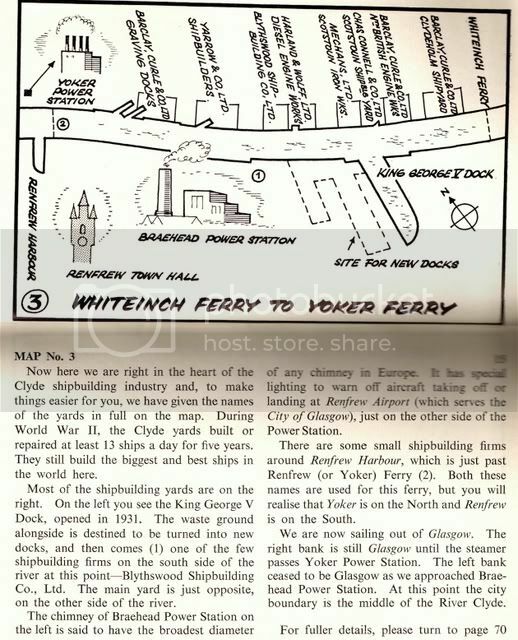 I remember the old chain driven Renfrew Ferry had a fare system (30p per journey towards the end of it's days I think). On a related note, can any ferry buffs tell me about this wee token. Date, and use, etc. 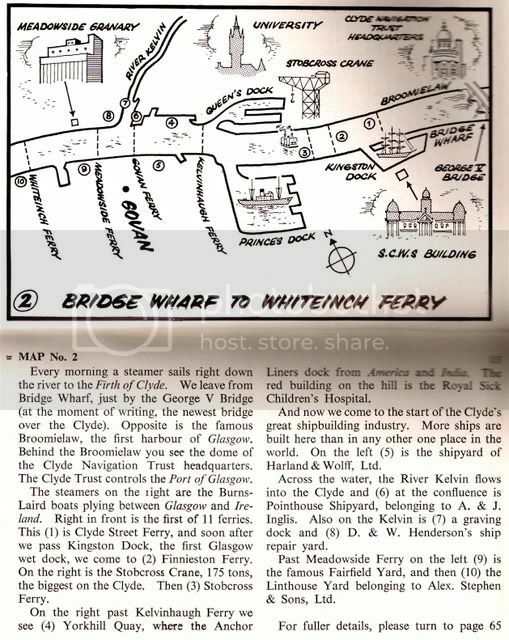 I'm reading Jack House's little book "Down the Clyde" published in 1959. The other two presumably being further west, I've not read that far yet. Perhaps though, there were two to the east of the Clyde St. Ferry? Anyway, Jack states that all the Ferries east of the one at Renfrew were free. Mods, the Clyde Ferries, should this be a project? Last edited by HollowHorn on Sun Sep 16, 2007 2:04 pm, edited 3 times in total. Remided me of the episode of The Vital Spark where the lad kids on he's working on a cruise ship but he's really working on the Renfrew Ferry.. I remember Billy Connelly saying a lot of the crews were Highlanders. They would tell the kids boarding "mind yer foots, mind yer foots" in their strong Highland accent. Aye Kenny, cheers for telling me that I had posted the same map twice! The ferry boats form an important means of cross communication between the north and south sides of the City and suburbs. The Clyde Trustees have at present ten cross harbour ferry steamers, licensed to carry from ninety-three to 110 passengers (nine of them having fire engines on board), for the service of the four cross ferries within the limits of the harbour, and for the two across the river below the harbour at Meadowside and Whiteinch respectively, and two vehicular and passenger ferries combined, one at Finnieston, about the centre of the harbour, and the other at Govan. The ferry at Govan has been in existence for many years, by a boat worked by hand wheels up to 1867, and since then by steam. 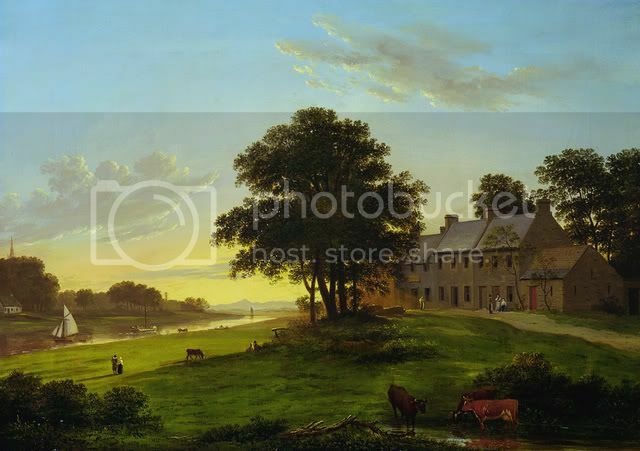 The first steamer accommodated three horses and carts and fifty passengers, or 200 passengers alone, and wrought on one chain stretched across the bottom of the river. A second steamer for the same ferry, designed by Mr. Deas, has two cart and carriage ways, one on each side, the passengers being accommodated in the centre. It carries eight horses and carts and 140 passengers, or 500 passengers alone, and is wrought on two chains, one on the inside of each cart and carriage way. 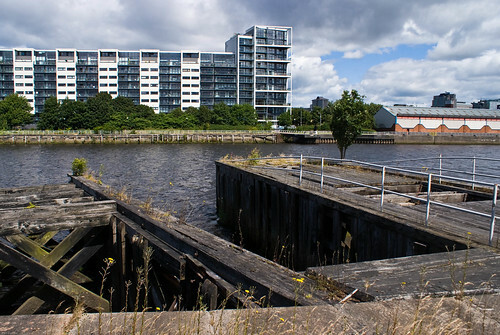 A vehicular ferry plies across the harbour at Finnieston, its main feature being an elevating deck raised and lowered by bevel and worm gearing, bringing the deck to the same level as the quay at any state of the tide. Photograph of Govan Ferry, from an album of views of Glasgow. The Govan Ferry linked Govan on the south bank of the River Clyde with the north. In the 18th century there was a hand-operated chain ferry in use. 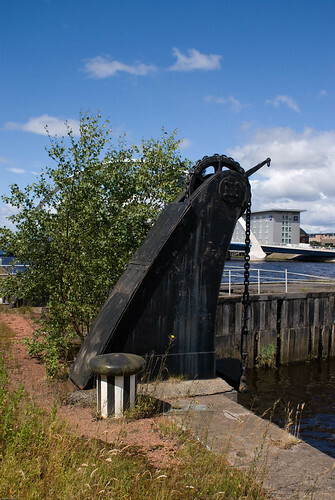 The Clyde Navigation Trust took over the Govan Ferry in 1857, and introduced one of the Clyde's first steam-driven ferries at this location in 1865. Later developments included a new vessel in 1875 which could carry 140 passengers and 8 carts. 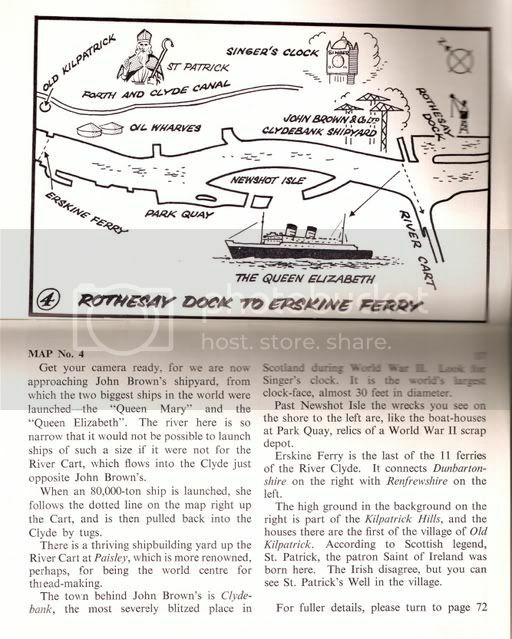 The Govan Ferry survived until 1965. HollowHorn wrote: Aye Kenny, cheers for telling me that I had posted the same map twice! 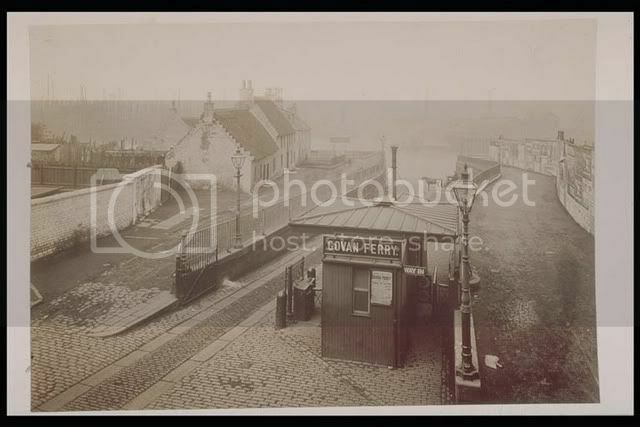 A couple of pics of the site of the Finnieston Ferry - I had originally thought that this was Stobcross but the piece HH posted suggests that that was further downstream. I'm not altogether ancient but I well remember the Govan Ferry. Every year at Christmas my Aunt and Uncle would take us six kids down to Govan Cross on the bus where we'd get the ferry over and walk to the Kelvin Hall for the circus and carnival. The smell to me was as strong and evocative as the old subway smell. 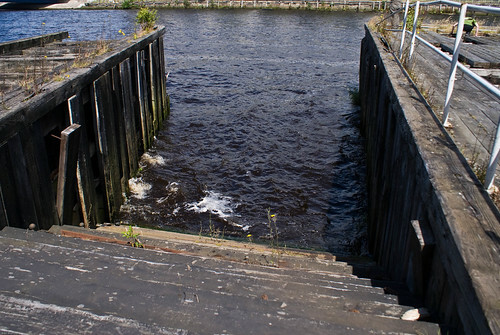 And those slimy green stairs you had to sometimes jump onto from the ferry!!!! Ooops, apologies Crusty & Sharon, I have a few copies of that on my shelf It's a first class piece of work. I've still got a stack of them if anyone wants one, or indeed several.